Here is a quick grab bag of updates, mostly related to my most recent trip, a super-short one to the Seattle area. If this awful yellow-room-yellow-light-phone photo doesn't scare you off, you will make it through the rest of this post! 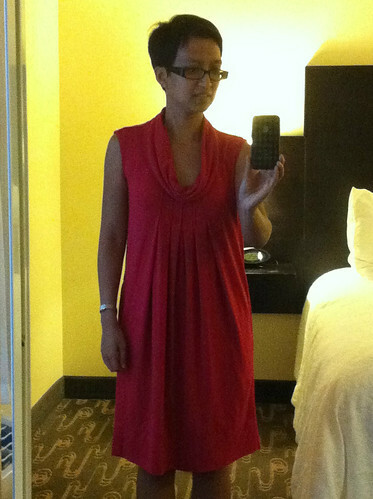 I took this photo right after I checked into my hotel in Everett, WA -- because I'd already worn the dress several times, and knew if I didn't take a pic now it might be never given the rate picture taking is happening in my life! It's made from this really yummy rayon-lycra knit that Kyle gifted me about two years ago. I didn't mean to make an exact duplicate of the pattern envelope dress, but there was enough of this red in my stash and it feels really great! With only three pattern pieces, it came together quickly. I did end up cutting the cowl on the bias, even though I'm pretty sure instructions are to cut on the straight grain. I always cut woven cowls on the bias and wasn't sure if it would make a difference for a knit, but I didn't want to chance it. With my birthday coming up, I'd begun obsessing about how many loose-fitting / empire or no defined waist / I might look like a small child kind of clothes I have made for myself. Do the clothes fit my age? After consulting a couple of new-to-me style books, I concluded that a good rule of thumb is to focus on a more defined waist. No more smocks. Unless they show some serious leg. ANYWHO the point is that V1179 really doesn't fit that need for a defined waist -- but it does feel very grown-up without being fitted at all. Age-appropriate? Check. Moving on! I've actually been sewing a decent bit this summer! So I'll try to post again later this week so I might have a chance of catching up. Have a great week! Sad we missed the big bubble and thank you for thinking of us. The terrarium is gonna be the shiz-nit! Looks just like the one on the pattern jacket - only with a better looking model. 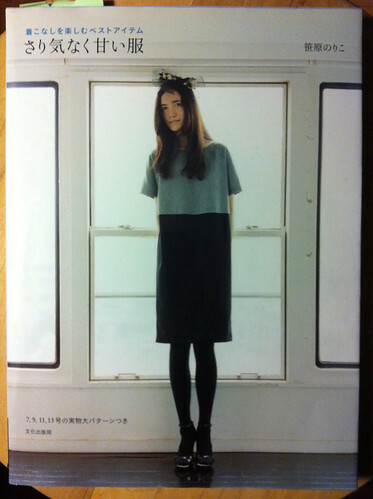 I've bought this pattern for our summer. Love it. The red dress looks great! I'm looking forward to seeing what you find to make in your new book. gorgeous job on that red dress! Perfect for traveling in style, I think. Looking forward to seeing the terrarium. Oh you are so cute! Love the dress. and that bubble is HUGE!! wow! love this red dress! it does look quite grown up! the neckline is wonderful. that's exactly the kind of dress I'd want to wear all the time - comfy, non-waist-threatening and eye-catching. I just don't waists, cos I have none. But you could probably afford to wear a big belt around yours and get extra hourglassy. Sure some dresses can come off as child-like but this one is definitely a grownup cut. However, you have a great figure so you should show it off some! You look good in the red dress. Red is such a grownup colour. But I think you could cinch with a big belt and still look dynamite! 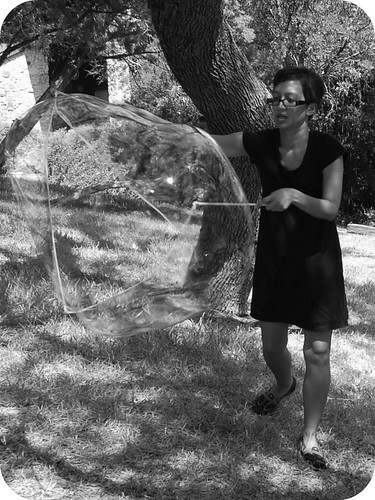 1.we are going to make those bubble wands today and I needed a pep talk, thank you. 2. I think drape drape is in english now, or maybe it's the pattern magic book I'm thinking of. 3. 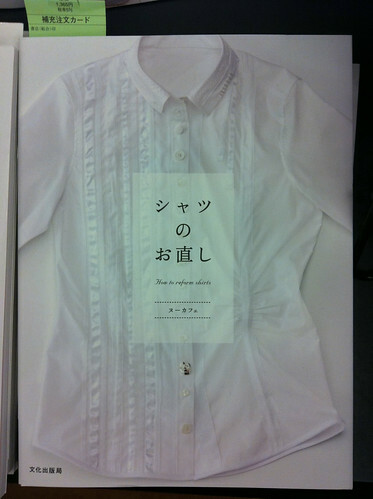 Just because there is a Japanese book about refashioning men's shirts doesn't mean you shouldn't write one in english! I think your red cowl dress is adorable on you! Love the dress! I have to ask you about this bubble thing. Thumbs up for the red dress! Sorry for me I haven't seen the bubbles you made! 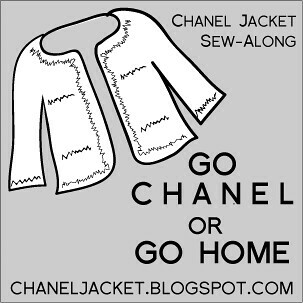 I also wanna share one of my bookmarked cheap clothing store on the net I recently encountered. This site aims to bring online shopping for cheap clothes, cheap dresses and other fashionable accessories. That terrarium looks awesome. And Vogue 1179 rocks. I'm doing a giveaway of it this month so if you know anyone that wants one send 'em my way.